Here is the list of channels broadcasting Copa America 2016 in different parts of the world. If we failed to mention any country you can always use the comments below to ask broadcasting details of any region. Brazil SportTV free to air channels in Brazil kept the rights. New Zealand Sky NZ Every game live in New Zealand and other pecific countries. Saudi Arabia beIN Sports Every game live on beIN Sports network. 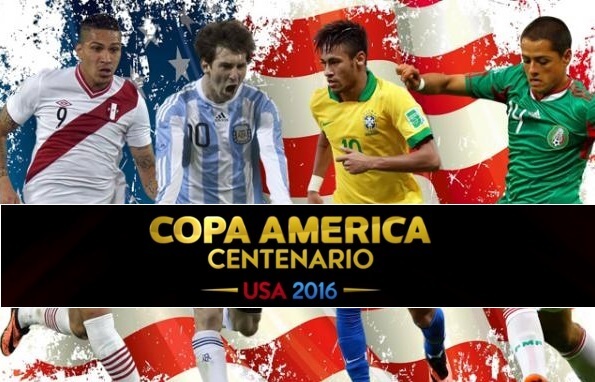 The special edition of Copa America set to take place this June 2016 in United States will be the biggest in history on every scale, from the number of teams participating, to extensive tv coverage around the world and of course in terms of marketability its massive considering 16 teams including the hosts USA are taking part. Many marketing researchers in USA are labeling “Copa America Centenario” as the biggest sports event taking place in USA since 2002 Olympics and 1994 FIFA world Cup. Copa America 2016 on Netflix ?. There are rumours that netflix will be broadcasting 2016 Copa America in South America countries and Canada. Which is a hoax and there are absolutely no details about the matter as of yet. The rumour started when it was listed in the wikipedia page. We will update this page couple of months ahead of the schedule start of 2016 Copa America with all the updated channels confirmed to broadcast. Last year beIN Sports had the rights to broadcast 2015 Copa America in United States but this year FOXSports has secure the english tv rights deal in the United States. 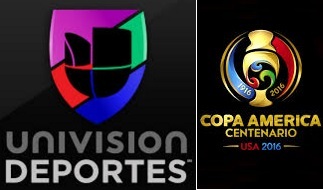 While Spanish network “Univision” has already bought the spanish rights for Copa America in USA for around $60 million. For Copa America 2016 most of the channels in south american countries has already secured the tv deals. Below is the list of all confirmed channels broadcasting this years Copa America in June. Will be watching from India. Uruguay r Argentina wants to be champion. Fingers crossed. beIN sports are showing it in Australia via foxte l.
Brazil will be win the cup! Like 2015, 2007 and 2004? The article says that the first match will be played on May 11. What the hell? Who will show it in India ? Sony Six , Sony Kix , Or BOTH ??? What about Pakistan? Any channel? sad that there is no broadcast in BHUTAN…..
Uruguay will have Luis Suarez back! how i can watch copa america in ksa? I watched every match last year on Premier Sport for free as Virgin Media gave it to us for 6 weeks FOC. Can’t find out where to watch in the UK this year. I know there will be streaming but because of the time differences it’s not always possible to watch live but to record and watch the next day which is what we did a lot last year. It still seems even though the tournament starts on June 3rd there is no information as to who, if anyone will be showing it in the UK. This is a problem as we are running a Copa America Facebook page. This is why we have so many people in this country who do not watch these games. We limit accessibility for viewing. How to watch it online in india? ?